Time to make some buzz! Let’s build a light theremin. 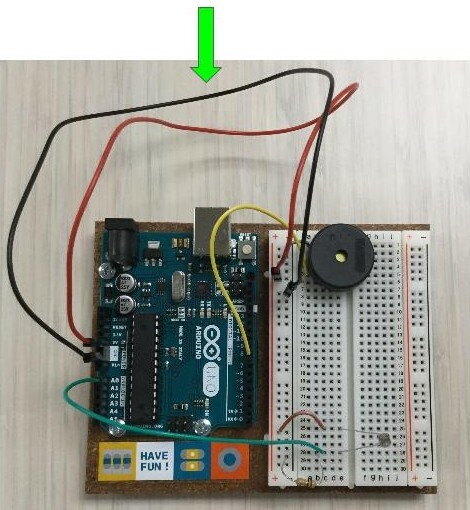 For this project you will need some jumper wires, a piezo, a 10k ohm resistor, and a photoresistor. 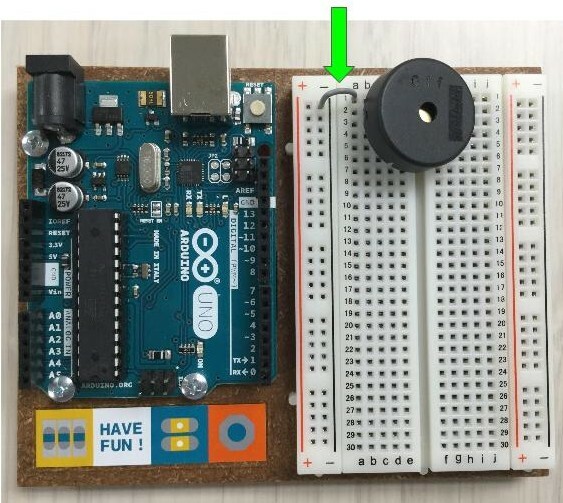 This time we are adding a sensor, the photoresistor, so that UNO can get input from the outside world, i.e. UNO can get interactive! 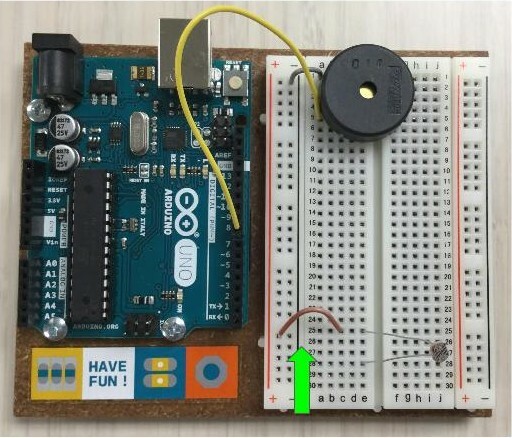 The piezo provides the buzzing and we control it by having UNO read the photoresistor. Gently insert the pins of your Piezo into row one and five. 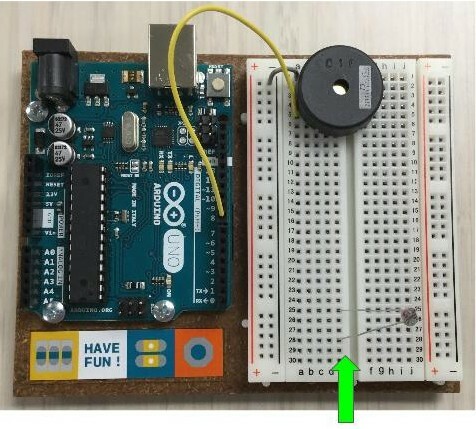 Insert the pins from the photoresistor in rows twentyfive and twentyeight. Connect the ground - rail to a GND pin on the UNO with a power jumper wire. Connect the power + rail to the 5V Pin on the UNO with a power jumper wire. Plug UNO into the usb, and click the upload arrow to load the sketch. 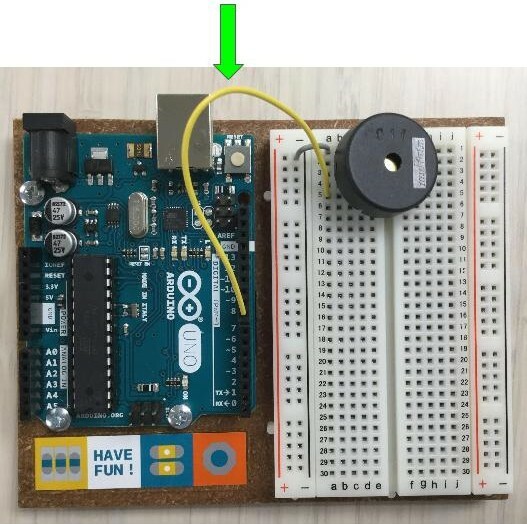 The first few seconds the program calibrates the photoresistor, so move your finger over and back to change the amount of light falling on the sensor. The buzzing will start soon - Enjoy! Make the buzz less annoying! 50, 4000 sets the range of tones we are mapping our sensor reading to. The lowest reading will translate to a tone of 50, the highest to 4000. Swap them so that it says 4000, 0. What does this do? 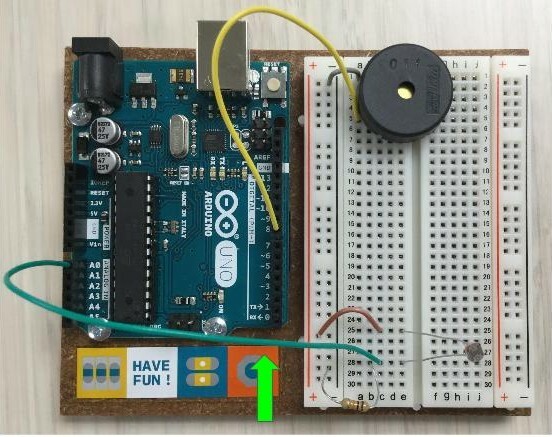 Download arduinoTeaching examples. Look for lightThereminBasic.ino, a heavily annotated version of p06_LightTheremin. 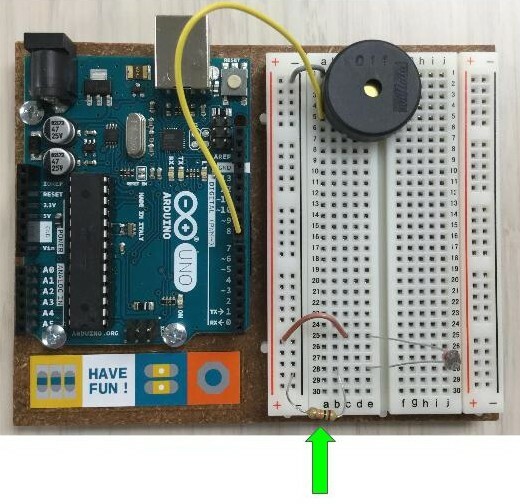 Hello Arduino! - cc-by-sa evan will - 2016.